I'm looking for a way to give every letter of a jit.gl.text3d a different color. 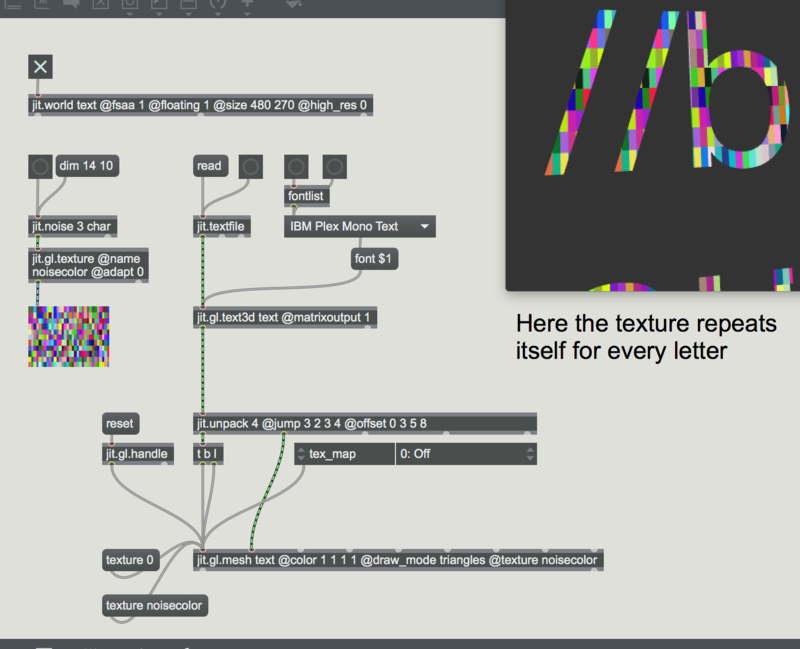 I am outputting the matrix of the jit.gl.text3d to a jit.gl.mesh to work from there with color and draw_modes. I have tried giving it a texture, but can not find a way to map the texture on the entire text (instead of repeatedly on every single letter). Other tex_map modes also don't give the result i'm hoping for. I also tried the jit.gl.mesh color array inlet, but i can not find a way to figure out how many vertices every letter has so i can give them separate colors. If i set the jit.gl.mesh to auto_colors 1 i get somewhat the result i'm hoping to get when using a texture. I included some pictures to show what i mean. Any help/suggestions are welcome. Came to this solution at the moment. So for now it is working! But with a large textfile the framerate drops insane. So apparently jit.gl.text rapidly outputs a matrix for every letter that has to be drawn (when matrixoutput is enabled). If you select a different color for every of those matrices you give every letter a new color within 1 frame render. hi Timo, thanks for sharing your patch. this is something that I have started piecing together a design for, an object that allows for jit.gl.multiple functionality with a jit.gl.text object's letters / words / lines. nothing has been implemented yet, but it's on the back burner. I think your best bet for efficiency is to pre-process by loading your file with gl.text, outputing the matrices, concatenating them together into a single matrix, duplicating those matrix dims for your color matrix, and then sending to the gl.mesh. maybe that gives you some more ideas to play with. Hi Rob! Thanks for your reply. Concatenating the matrices seems like a good idea indeed! Thanks for your patch.